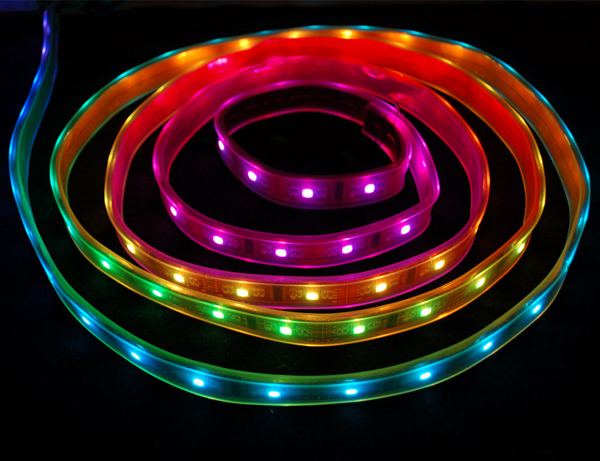 Using RGB LED Strips to Monitor Bandwidth « Adafruit Industries – Makers, hackers, artists, designers and engineers! Over on the IVC Wiki, there is a nice writeup on how to create a giant bandwidth meter using a couple Arduinos, an ethernet shield, and some long sections of RGB LED strips. After discovering how cool RGB LED strips are, I decided to make a bandwidth monitor for the Internet connection at our place. Since there are many users active on the same connection there’s bound to be conflicts where someone is gaming and another is downloading, causing the ping to fluctuate (even with QoS HTB-init set up).